Nutcracker Auditions! - Super Inky! Every Saturday morning, I have ballet class. 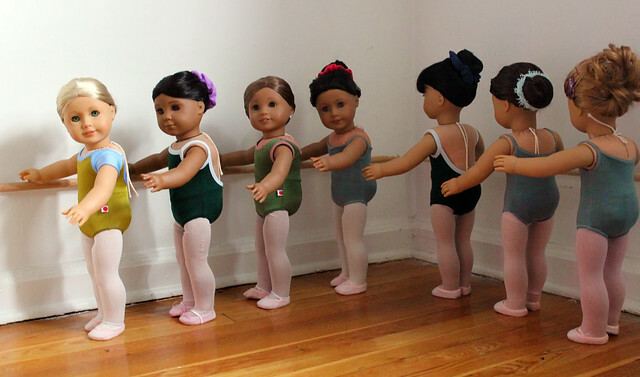 Saturday morning ballet class is difficult- I have to wake up really early in order to get to class on time. The subway doesn't run as frequently on weekends, so I have to be prepared to wait for the train. This Saturday was special- after class, we had Nutcracker auditions! Since auditions were coming, you'd think class would be a bit more relaxed, but it was not. Even so, some girls wore their hair differently so that they'd look more unique at the audition. I was feeling very nervous in my belly. I have been seriously thinking about leaving ballet, but I love performing in the Nutcracker. I decided that I would audition for a part and see what happened. My friend Coral is in my class this year and I knew she was really hoping to be in the ballet. If we were in it together, it would be a lot of fun! I tried very hard to concentrate during class, but I kept missing steps because I was thinking so hard about what part I might get (or not get). Luckily, the ballet mistress was very understanding. Soon, the auditions began. All the kids sat on the floor of the studio, waiting their turns. Most of us sat with our class groups. I was proud to sit with my new level; we wear green leotards! There were still some girls in my old class, the pink level, that I recognized. I waved to them and they waved back. It doesn't matter that some of us are in different levels- anyone can audition for any part. You might not know this, but sometimes you get a part just because you are the right height! Soon my name was called. I went up and danced my heart out. As soon as the ballet mistress asked to see me do a pas de chat, I knew my part- and I was right! I'm a polichinelle for the third year running! I don't mind, because I love being a polichinelle! Coral looked over at me and gave me a thumbs up. I know she was nervous at that point because polichinelles and candy canes (hoops) are the "best" parts for girls our ages. Still, I knew she really wanted to be a party girl, even though she's a bit old. Coral is short though, so she had a chance! Finally, Coral was called up with Freyja Schultz. Freyja was the best dancer in our class until Coral came along. Freyja isn't Coral's biggest fan as a result. 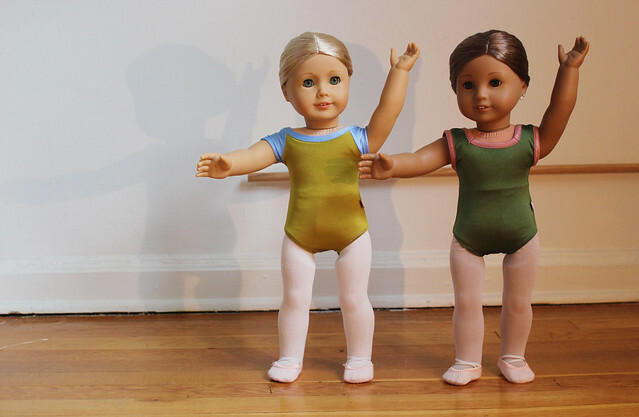 The both started to do a pas de chat when the ballet mistress called them to her. She patted them each on the head and said "These are our Maries!" Coral turned and looked at me with the biggest, happiest eyes! Marie is what our school calls the main girl's part- often called Clara! Wow! Coral had clinched the best part in the entire ballet! Holy hotdogs! The ballet mistress quickly declared that Coral would be in the B cast, since it was her first year, and Freyja would be A cast. (Freyja was Marie last year too.) You could tell Freyja was upset that Coral got such a good part in only her first year at her school. I was so proud! Go Coral!!! The only downside is that I'm in the A cast this year, but that does mean that Coral and I can go see each other's performances. Wow! What a great end to a nerve-wracking audition! Have you ever performed in a ballet, play, or other performance? Did you get the part you wanted? 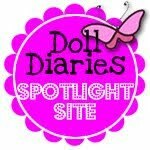 In this entry I'm wearing: green leotard with light blue edging by Dynamite Threads. 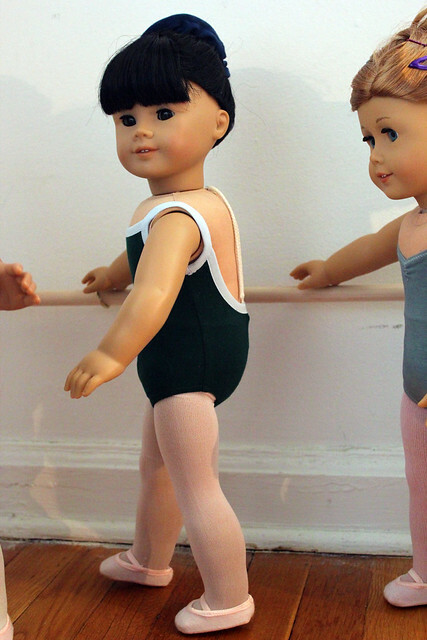 Tights and ballet shoes by American Girl. Congratulations, Inky (and Coral, too)! :D We can't wait to hear how your performances go. Thank you Emma for your sweet congratulations! Congrats Inky! That sounds like so much fun! 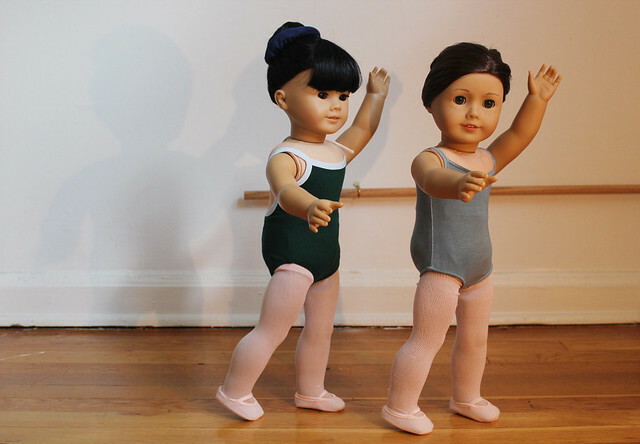 Do you know where I can get one of those Yumiko leotards for my dolls? They're adorable! Hi Grace! Thank you for your congratulations. The Yumiko leotards were made from real, human Yumiko leotards. One of them (Freyja's) was custom-ordered and the other (Coral's) was bought at the Yumiko boutique's in-stock supply. Once we had the two leotards (They are about $65 each), we sent them to our favorite seamstress, who recreated the leotards for us, using the original tags. :) If you'd like to make your own Yumikos, I recommend buying the original Yumikos, then sending them to your own seamstress. The leotards that Kaya and I are wearing are "fake Yumikos." They're just regular leotards with the contrast edging that Yumiko is famous for. Thanks so much! I'll have to look into that! Yeah Inky, I am so excited for you, it is always great when you get a part you like and tell Coral good job too. How exciting for you both, sorry you are not on the same days, but you will have fun I am sure. I have not done anything as big as your dance class and performance, but little ones and loved it but was really nervous at the auditions. I'm really glad I got a part I like. I'm sure even if the audience for your performance was smaller, that it was just as important and exciting for you! I miss you! I hope we can see each other again soon. Congrats! 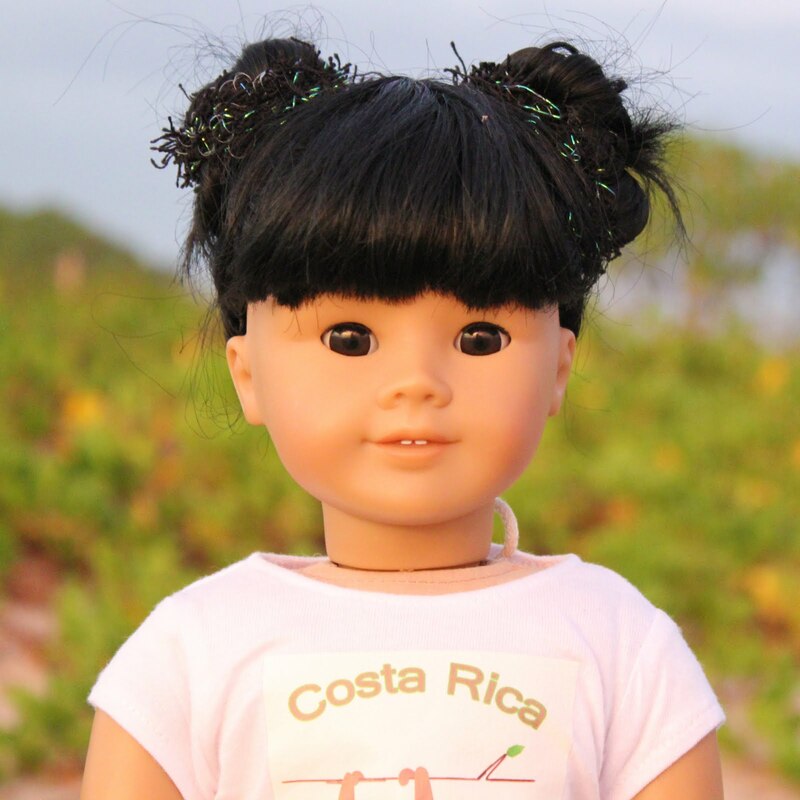 And congratulations Coral, too! That sounds super exciting! I can't wait to hear about both of your performances! Thank you Saoirse! I will be sure to keep you updated and I will pass your congratulations along to Coral! I'm very happy for you girls, and I'm sure you'll have a lot of fun. I personally love performing and being in the spotlight, but when it comes to singing, of course. I auditioned for a talent show, and I made it! I wished that I auditioned in the past, though. I love singing so much; I wish I could be a famous pop star! Saturday morning classes are never fun- in France, we have school on Saturday (half a day, normally)! Sunday is the only day I get to sleep in. It's miserable, especially after being exposed to the American system. Félicitations! C'est chouette! In America, I got the role of the Dew Drop Fairy. It was a great role for me, especially since I got to do my routine en pointe! Malorie was the Sugarplum Fairy- they normally gave that role to girls who were seniors in high school, but Malorie had far more experience than them, plus she is very tall. I forget what Chrissa's other roll was, but she was ALWAYS in the Waltz of the Flowers. I felt bad; she didn't deserve that every year. I also participated in school plays while in the States. I was always in the ensemble, though, because upperclassmen usually got the speaking roles. I just wanted to dance, so it was fine. Footloose was the best musical to be in. That would be so cool if you were a famous pop star. If you make it, could you give me a backstage pass for your NYC show? Yes, my mama had Saturday school when she lived abroad as a girl, and she hated it too! It's not so bad if you're used to it, but once you're accustomed to weekends off, it makes it a lot harder to go back to Saturdays. Wow! Congratulations on being Dew Drop! In my school/company's performance, Dew Drop and Sugar Plum are adult roles. So is the Waltz of the Flowers. In fact, once you get too tall for children's roles, you don't usually perform again until you are an apprentice or in the company itself. Luckily, older girls can perform in our school's annual workshop performances. I've never been in a school musical, since I'm homeschooled. It sounds really fun! Coral's school puts on musicals, but she says she hasn't been in them because the rehearsals are during her ballet classes. Are you performing in anything this year? Congrats! I just auditioned for Nutcracker and am a red solider! Where did you get the other leotards besides yours? So cute! Congratulations on being a red soldier- that's so cool! Where do you study ballet? The Yumiko leotards (the ones with the white/red tags on the sides) were made out of Yumiko leotards. The dark green ones with the powder blue edging were made out of a Capezio leotard with foldover elastic to make the blue contrast. 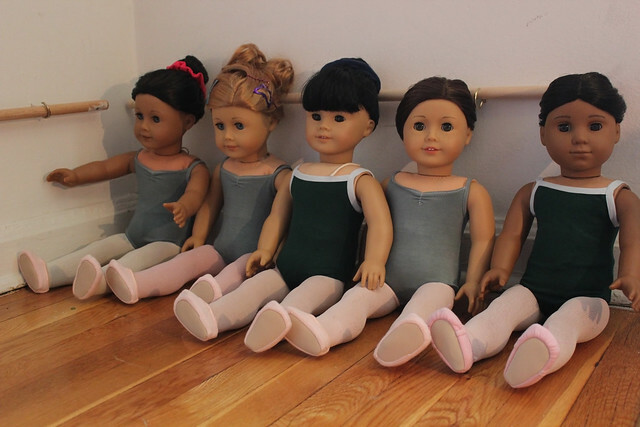 The other three, sage green leos are from the American Girl 2-in-1 Ballerina outfit, but were dyed green. Levels 5-8 have pointe also, I just started! I got the role of a Red soldger and I cant wait to perform. My friends Kiki and Ember did, too. My friend Kanani got the role of Marie in the B cast sadly. But on the bright side my friend Callie (she will make a blog ASAP) got the role of Marie in the A cast. And last, my friend Blake is being a polichinelle like you. one Question. Is the royal blue higher than Hunter green? I dont know yet. I wish I could be my next level. Maroon. My friend Ava loves Maroon 5 a LOT. How awesome that you'll be a red soldier! Am I reading this wrong? After 2 years of Royal blue, I'm a Maroony! I'm looking on sab.org. Where are you looking? Oh shoot. Can you delete those? Including ths one. I will retype all of them. Why do you want me to delete them? Those were the adult levels. Oh fail. I will re-type the first comment corectly. Congratulations, Inky! That is so awesome that Coral is a Marie. None of us are serious dancers, so we don't have any experiences like that. I think just auditioning would be soooooo scary! I wish I could come see you dance. Coral is so excited! Luckily the auditions aren't that big of a deal because the ballet mistress teaches our ballet classes sometimes, so we're used to her. I'm sure you would do just fine at an audition! Someday, you will definitely have to come see us dance! Wow congrats Coral and Inky! I'm auditioning for my school production of the Nutcracker in a week; I'm really thrilled. I am hoping beyond hope that I will get Clara. I did play her last year; but still. I may be one of the best dancers in the class, but one wrong move, one new girl, and it's over. Then in May I'm auditioning for Shakespeare's Tempest; which I also can't wait for! And I may do some other stuff in-between. Since I go to a preforming arts school; there are always tons of opportunities to be in shows. I don't do that many, though, because I focus mainly on my dancing, but my friend Samantha does. Anyway, congrats, I can't wait to hear more. Thanks Rebecca! Coral goes to a performing arts school too- the Professional Children's School. All of the kids there are professionally working kids, so Coral isn't alone in her class. 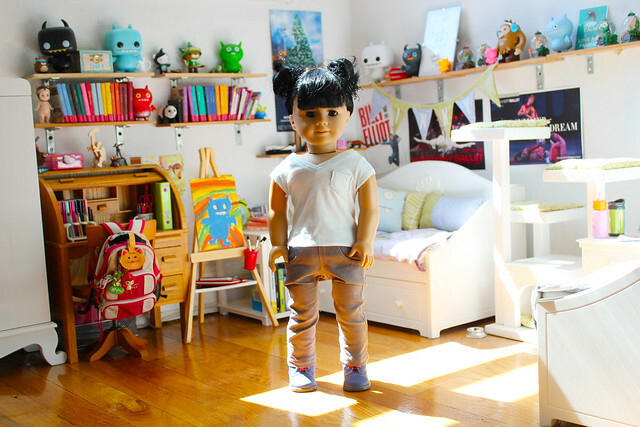 I'm homeschooled because my parents travel a lot- plus PCS is really expensive! Way to go, Inky! The polichinelles are so muh fun!I've done the nutcracker twice before. Once with The Ballet Academy where I take lessons and once with the touring company of the Great Russian Nutcracker. I was a polichinelle at school, but the little angel in the professional production. Do you have a picture in your polichinelle costume? I would love to see it. There are so many different variations out there. Enjoy your show! And please let us all know how it goes. Congrats Inky (and Coral)! You both have awesome parts! I would love to be Clara but I'm not that good. Our ballet classes are bit different, in Star Valley. We don't really have levels; we go more by age. The few times we've done The Nutcracker (which is a shorter adaptation), I've usually been a flower or snowflake. I think a Party Girl would be fun, too. Felicity played Clara a couple years ago. She was excited because Clara is the part that Felicity of Pleasantville plays. I don't know if we're doing The Nutcracker this year but I know there's going to be a Nativity play that I want to try out for (it's not ballet, lol). I'm glad you didn't leave ballet. You really seem to enjoy it and I definitely get nervous with any kind of audition. Hope you had fun in the Nutcracker Inky! I have been in it for many years (as well as some other ballets) but I have yet to get cast as Clara! Those little Yumiko's are adorable! I have my first Yumiko coming in the mail! I'm so excited!